Results from a quick visit to the area. Nine samples collected from shallow bulldozed old worked areas were analyzed. These were not from the coastal cliff exposures but from an area some 200-400 m back from the coast. It is not clear if this area produced gold but it had been cleared and shallow trenches and waste heaps were present. 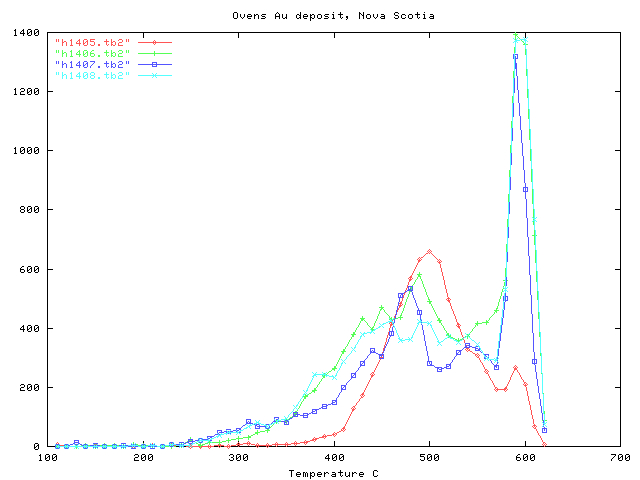 The most obvious feature is that 2 of the 9 samples show high CO2 content - with a prominent peak around 260 C. But not all samples show this, so there are significant differences between the quartz samples which are not easily noticed in the field, and which may be useful in an exploration context in trying to identify potentially auriferous quartz veins. 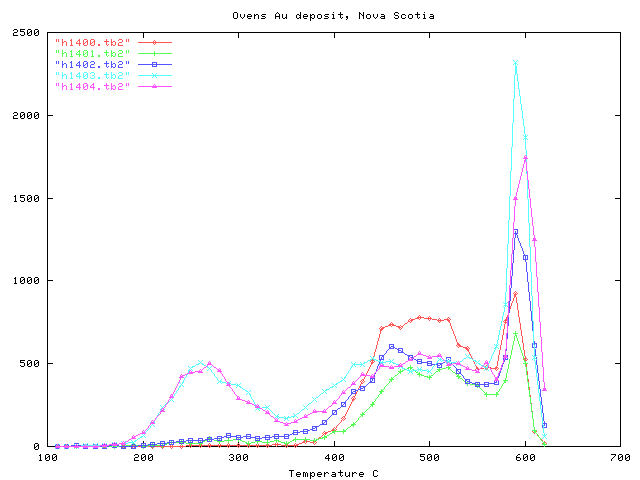 Decrepitation of these samples shows that the method readily discriminates several different types of quartz and is applicable to Nova Scotia auriferous quartz deposits. However it is necessary to carry out more extensive and thorough research to understand the relationships of the observed variations in fluid inclusion characteristics. semi transl milky white qtz.